“El Fin del Mundo” Moon Kyungwon and Jeon Joonho, El Fin del Mundo, 2012, film still. Courtesy of the artists and Gallery Hyundai, Seoul. Predictions for the future grow from the anxieties of the present. Faced with frightening realities like the effects of global warming and dwindling natural resources, projections about how to resolve these concerns reflect on the values of society today. The artists Moon Kyungwon and Jeon Joonho seek to understand the anxieties of the present by imagining a future utopia in the collaborative exhibition “News from Nowhere: Chicago Laboratory,” on view at Sullivan Galleries through December 21. Moon and Jeon, both Korean artists, first met in 2007 at the Taipei Biennial where they began a dialogue on the meaning of art making. They shared an interest in exploring how art could be more than meaningful to the ego of the artist, but also be a useful and critical contribution to society. In their collaborative exhibition “News From Nowhere,” the artists seek to create a two-way dialogue similar to the feedback loop creative industries such as architecture, design, fashion, and engineering receive when working with clients. The Sullivan Galleries show is the United States version of the project, which was originally exhibited at Documenta (13) in Kassel, Germany. 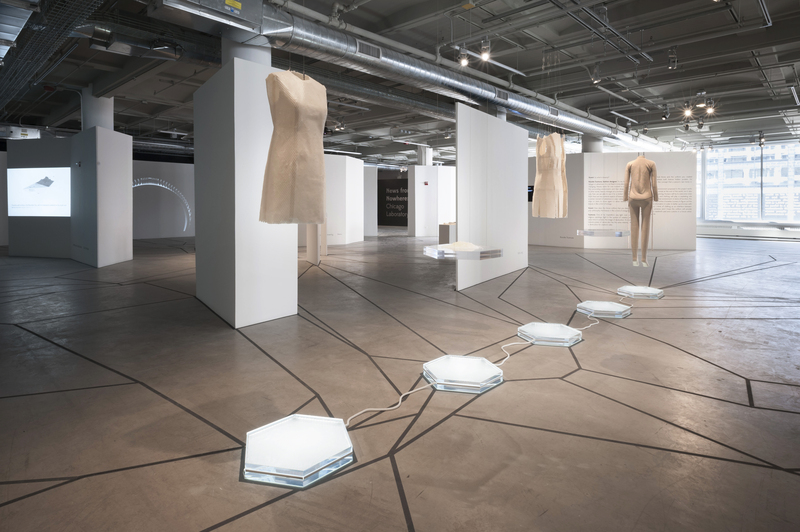 The physical layout of “News From Nowhere: Chicago Laboratory” was custom-designed by the artists and takram design engineering, just one of the many international collaborators participating in a series of events related to the current installation. To begin, Moon and Jeon interviewed a cross section of people both in Korea and abroad, from poets, to doctors, to students. The intent of this process was to better understand present anxieties and what people believed they would need from basic necessities in a future world. Moon and Jeon processed this information by developing a set of ideas for the objects that all humans will need to survive on the future earth. The next step of the collaboration involved selecting contemporary creative experts who could actually construct these objects. Who are these engineers of this imaginative future? The collaborators include: Toyo Ito, the 2013 Pritzker Prize-winner (Tokyo); takram design engineering (Tokyo); MVRDV design collaborative (Rotterdam); Kuho Jung and Kosuke Tsumura, fashion designers (Seoul and Tokyo, respectively) and mime Yu Jingyu (Seoul). MVRDV and The Why Factory, I-City, 2012, film still. © MVRDV and The Why Factory at Delft University of Technology. When considering the inventions included in “News From Nowhere,” it is important to understand that these objects transcend their physical form or the utilitarian purpose of fulfilling basic survival needs such as food, water, clothing, and shelter. They are intended to speak more broadly about the way that we as humans interact with our environment and within society as a whole. The I-City by MVRDV is a computer-generated simulation of a nationless future world that illustrates the constant negotiation between collaboration and individual pursuit, allowing the viewer to manifestly participate in the interchange between “we” and “I” at the core of society. 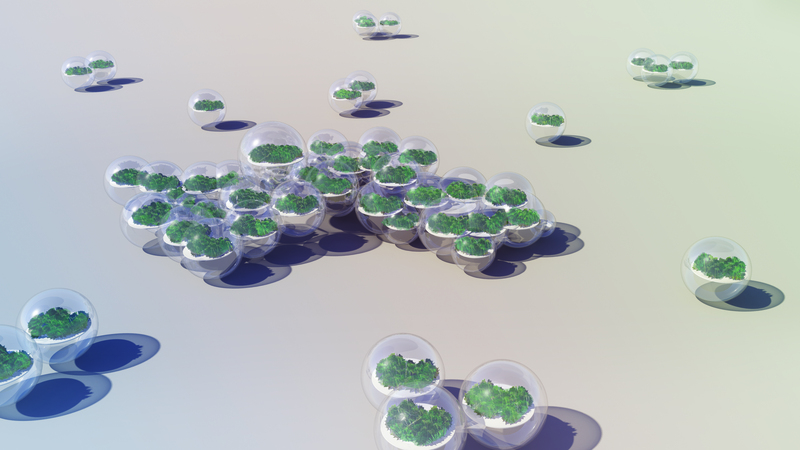 In the simulation, each I-City is its own self-sustainable living unit, an entire ecosystem contained within a bubble. It represents a single “I,” yet it is mobile, and can join other units to become “we,” facilitating communities and clusters for exchange. Every unit is equipped with a share setting, allowing each individual a choice in their engagement with society. They can connect, allowing for participation with and contributions to a community network; or they can choose to disengage entirely, living a solitary yet self-sufficient existence. Looking at the objects and designs developed by each collaborator in “News From Nowhere: Chicago Laboratory,” we recognize a similar interchange. The solutions proposed within the exhibition serve not to be authoritative, exhaustive answers, but instead, to encourage further contemplation. We are asked to inquire into the fundamental nature of everyday objects. For Moon and Jeon, light becomes a symbol of the pursuit to understanding our designed world, and our desire to implement beauty. In the two-channel film playing at the entrance of the exhibition, “El Fin del Mundo,” light is used to convey the interconnectedness between past and future. The two characters: man/artist, alone in his studio at the end of the world; and woman/scientist, in a laboratory built in the future, interact in the same physical location during different times. Their relationship is portrayed as a spiritual connection, illuminated through the medium of light. Moon Kyungwon and Jeon Joonho, News from Nowhere: Chicago Laboratory, 2013. Installation view, Sullivan Galleries, School of the Art Institute of Chicago. Photo: James Prinz. The source of the light connecting past man and future woman, a strand of ordinary twinkle lights, heightens the complexity of the banal object as a spiritual and transcendental symbol. Through the illumination of this unremarkable strand of wire and plastic, the essence of beauty is revealed. In the film, this discovery signifies to the future woman that her assigned task, to find the meaning of life, has been fulfilled — she packs away the strand of lights and leaves the laboratory. Through this juxtaposition, Moon and Jeon question not only the role of the object in our understanding of human consciousness, but also what constitutes art and beauty. “News from Nowhere” seeks to build a greater consciousness of the present through imagining the future. Human society is constructed with material beyond our ability to invent tools and to alter the environment; our shared world is a contemplation on the existence of the intangible that reaches beyond what we can build, engineer, or explain. The intent of Moon and Jeon’s research and collaboration is to prompt consideration of how, as individuals and a collective, we currently function in comparison with what we understand as ideal. The answers found through this thoughtful collaboration and proposal to imaginatively negotiate towards a universal goal give rise to greater questions. “News From Nowhere” demonstrates the power of our shared desire not only for comfort and security, but to capture the essence of meaning and beauty, through art and object. News from Nowhere: Chicago Laboratory is on view at SAIC’s Sullivan Galleries (33 S. State Street, 7th floor) through December 21, 2013.